Named after the wife of Canada’s Governor General, the Lady Elgin was built in Buffalo, New York in 1851. 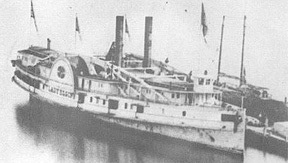 An imposing sight at 252 feet long, she saw service as one of the most elegantly appointed sidewheel passenger ships of the time. Catering to the rich and famous, the Lady served faithfully for nearly a decade, despite being damaged and repaired multiple times over her career. Her final voyage came on the night of September 8, 1860. During the night, she was rammed by the Augusta on the port side, damaging her severely and leaving a large hole below the waterline. Within 20 minutes the Lady Elgin broke apart and sunk. Despite the heroic efforts by the captain and crew, over 300 lives were lost on that fateful night. She was rediscovered in 1989 by Harry Zych, after a long legal battle, Zych was awarded ownership of the wreck site. Currently, permission must be obtained prior to diving the site. The Lady Elgin sits in 55 feet of water and is a great wreck for intermediate divers to explore and reflect on her history and the events of the night that she succumbed to the depths. We visit the Lady Elgin from Hammond Marina.